The Columbian Exposition Half Dollar was the first Classic Commemorative Half to be made. The coins were produced in 1892 and 1893 to commemorate the 400th anniversary of Christopher Columbus’s voyage to the New World. Another well known coin made to commemorate this event was the Isabella quarter. sure many rare coins were lost forever because of this! These coins have always been very popular with collectors. The very first coin was bought for $10,000 as a publicity stunt by the company that made Remington typewriters. Since then, this commemorative half has enjoyed its place in many numismatic collections. The reverse depicts an image of the Santa Maria. This was Columbus’s main ship he used in his voyage to the New World. The reverse also shows two globes under the ship. 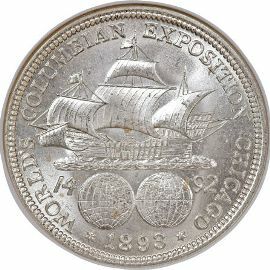 Inscriptions on the reverse read "WORLDS COLUMBIAN EXPOSITION CHICAGO" and the date "1892" around the outer part of the coin. The vast majority of these coins were mishandled therefore lowering the grade of the coin. 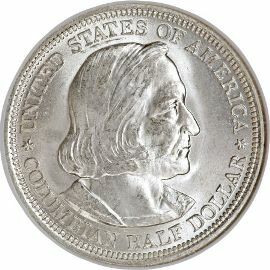 These coins are fairly common in lower grades due to the fact that a good percentage of them ended up in circulation. A lot of these coins were stored in bank vaults for years. It would not surprise me to find one in an old Half Dollar bank roll. The hunt is on!